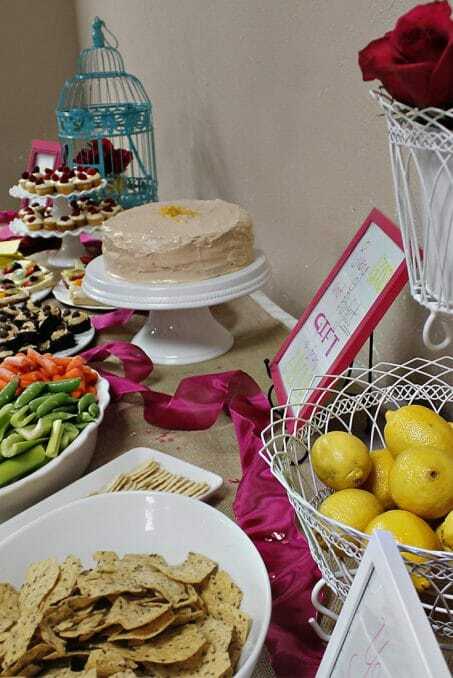 A gorgeous lemon and roses dessert bar baby shower full of easy, yummy dessert ideas and baby shower game ideas. Two years ago — writing that makes me feel so old!! — we celebrated my soon to be baby girl. My sisters threw the most gorgeous baby shower. It was an evening dessert bar filled with lemons, roses, and birdcages. Such a fun theme and I love all the little details they put together. With baby #2 coming in just a few months it’s got me thinking back to celebrating Clarabel — when she was still just known as Baby G because we had yet to come up with a name for her — so I thought I’d share some pictures from that fun celebration here for you all. 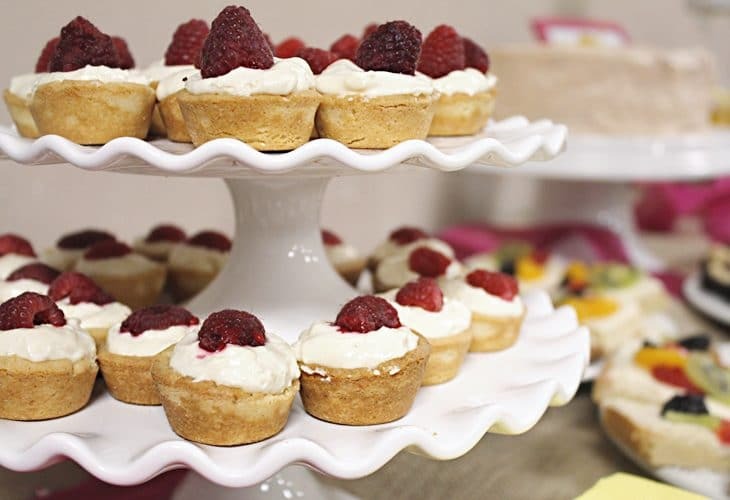 So, with that, I give you, a lemon and roses dessert bar baby shower. 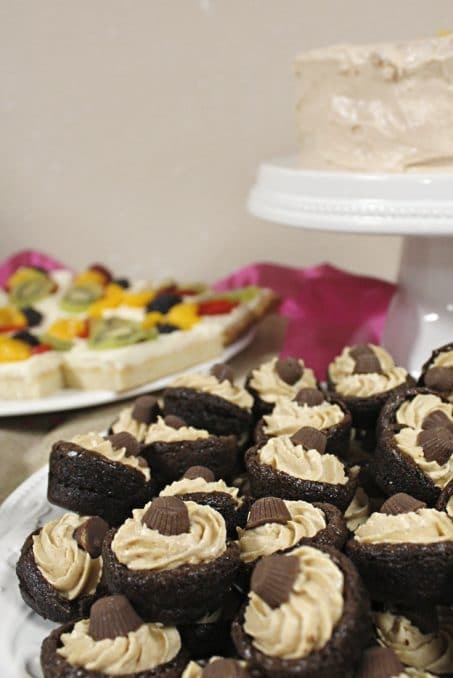 Peanut butter marshmallow brownie cups — these are my absolute favorite! I could live on this sugary goodness. We loosely use this recipe from InsideBruCrewLife. For the peanut butter filling we use 1 package cream cheese and 1 cup peanut butter beat together until smooth, add 1 cup powdered sugar and 1 tsp vanilla, fold in 2 cups cool whip. And I despise peanut butter m&m’s so instead we use mini pb cups. Seriously friends! Make a big batch of these brownie bites and throw them in the freezer. When you’re ready for a snack pull out a few and YUM!!! So tasty! We also had some crackers and veggies for those that wanted to be a little more healthy. I love how all these decorations turned out!! My sisters did such a great job! And here’s the kicker, they were determined to plan this baby shower without Pinterest so they would have original ideas. 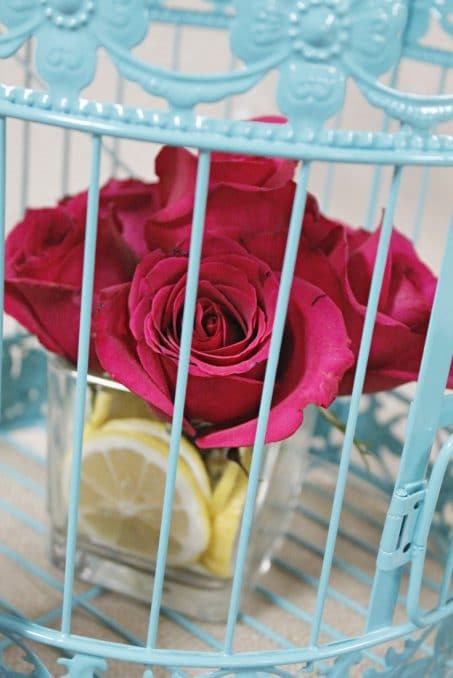 They knocked it out of the park with the birdcage/roses/lemon combo. It turned out so cute and I couldn’t be more thankful for my precious sisters! And what’s a baby shower without a few games? 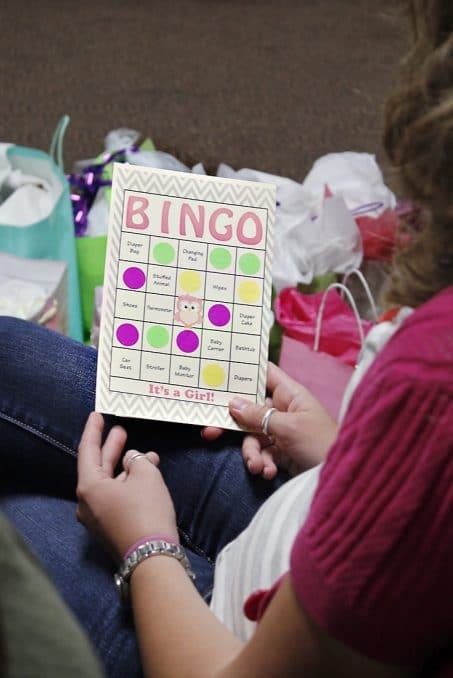 My sisters found these baby shower bingo cards on Etsy that included possible baby shower gifts. Each guest got some garage sale dot stickers and as I opened gifts guests got to mark off their bingo card if I received one of the gifts on their card. The winner then got a prize! 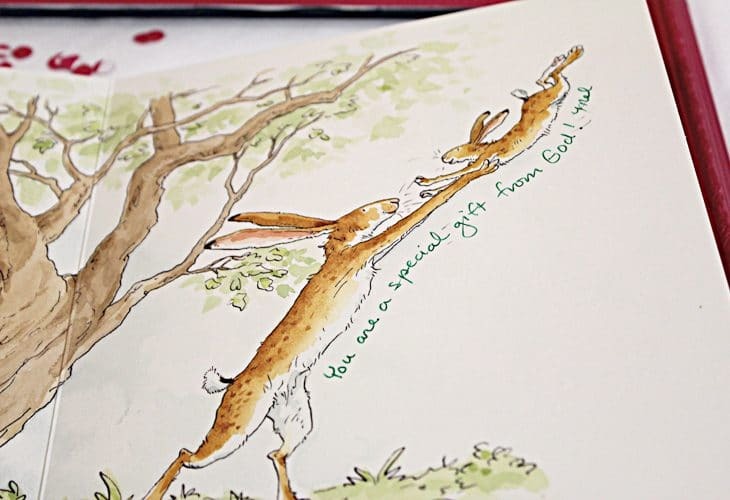 They also bought the children’s book, Guess How Much I Love You, and asked guests to write sweet little message to baby g as the guestbook. Such a cute idea! 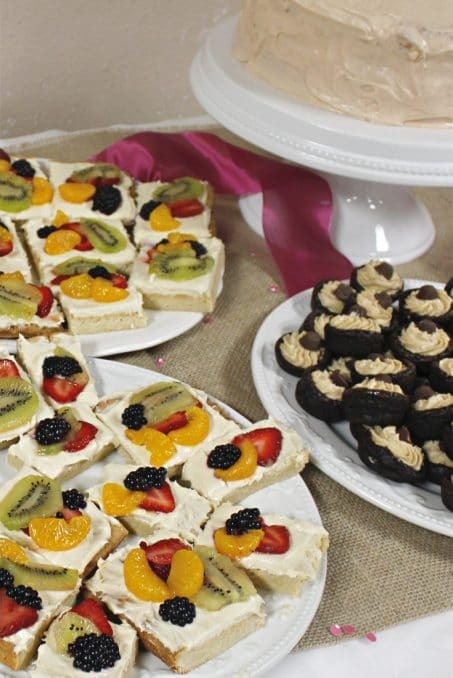 What do you think of my dessert bar baby shower? Have you tried planning a party before without perusing Pinterest? Not going to lie, that would be so tough for me to do sometime but a fun challenge! I still am in awe at the fact I planned our whole wedding before Pinterest days and somehow it turned out great! Success! 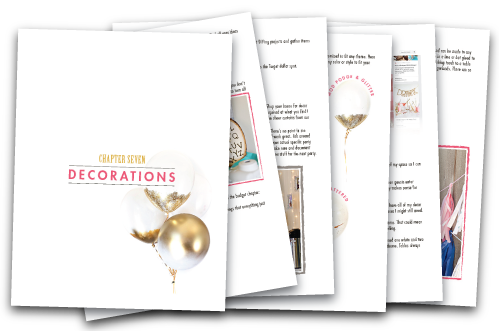 Now check your email to get your free sample chapter of The Ultimate DIY Party Planning Tool! Just a awesome and enjoyable post for me. Thanks a lot.